Urban Legacy XXL is an incredible new product from VIP Loops that will help reshape how producers and beat makers think about using loops, riffs, and one shot samples in their production setups. It's a massive 13 GB sample library of 20 combined products built on the Kontakt engine. Urban Legacy XXL is a great production tool for in the studio work or on stage in a live performance setting. Sporting a 16 pad, 4 bank customized interface, this product is truly unique in the virtual instrument world. 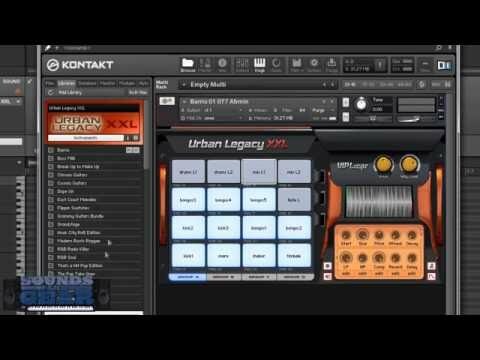 Urban Legacy XXL was built to be the backbone for your modern productions in the styles of Hip Hop, Trap, R&B, Pop, Soul, Reggae, and Gospel. Urban Legacy XXL represents some of VIP Loops' most popular products remastered, and a huge selection of brand new material that makes for the perfect combination of elite loops, riffs, and one-shots delivered by the best sound development team in the business! Why is Urban Legacy XXL special? The feature that sticks out on Urban Legacy XXL is first and foremost the sounds, which are current and sonically impressive. These are the sounds that are being used on hit records right now. When you combine these incredible sounds with an interface that was built specifically to take advantage of the quality of these sounds and the styles of production that are being used today, now you have something unstoppable! Then you have a feature not found in many of the most popular pad based production machines today and that's real-time time stretching. The nice thing about this product is that it's the perfect compliment to both pad based sequencers such as the Maschine and MPC Renn/Studio/Element and traditional DAW's like Pro Tools, Logic, Cubase, Studio One, Nuendo, FL Studio, Sonar, and nearly every other DAW on earth. Think of this as high octane fuel for your DAW or production workstation. Go from 75 BPM to 130 BPM without changing the pitch or hearing unwanted artifacts in the stretching. It's a beautiful thing, saves time, and allows you to make better productions, quicker. All of the pads/sounds on ULXXL are independent meaning that you can adjust the on-board effects, volume, panning, and tune for individual pads/sounds without affecting the others. Want reverb on just the snare, but not the rest of the kit? No problem. Want a delay on that guitar riff, but not on the keys? No problem. Welcome to freedom. And now that we've mentioned the effects let's talk about them! The on board effects section includes reverb, delay, compression, bit crusher, and high pass and low pass filters allowing you to tweak all day long. Easily assign an effect to a knob or fader by simply right clicking and turning or moving the knob or fader on your controller. Want that lo-pass Drakeish and Dr. Lukeish style filter build? You've got it! Quick, efficient, and easy to use. Want to chop down a loop or riff into a smaller portion? No problem, just use the start and end markers to truncate the file. Produce the way you want to. Note Repeat is a must have function for most modern day productions whether you are doing EDM or Trap, you have to have those fast rolls and ULXXL has it right at your finger tips. It works flawlessly and sounds incredible in the studio and on stage. You can really create some new and special sounds using note repeat in conjunction with the other effects. Or try using the latch mode with note repeat for live performances that will blow you and the audience away. Urban Legacy XXL is an incredible product that sounds fantastic and modern, easy to use, and will make you much more efficient in the studio or in a performance at a price point that won't break the bank! You gotta have this one in your sound library. VIP Loops, the creators of Urban Legacy XXL is a team of multi-platinum producers, musicians, artists, and engineers with a impressive list of credits, and are responsible for tens of millions of records sold worldwide. Many of the sounds we create can be heard at the top of today's and yesterday's charts. We put the power of multi-platinum sounds in your hands. Welcome to VIP baby! Note: Full version of Kontakt required to us this product!